Last weekend saw myself, Sandra and Thanh descending on Duncan's home for an afternoon of crazy macaron making. Now, as many of you will know, Duncan is the macaron master, so I am not even going to attempt to provide you instructions on how to make them. Click here for a proper guide. Sandra & I provided a mostly storebought picnic lunch - including baguettes, cheese, Brazillian guava paste, cornichons, salami, and avocados (only $1.25 for a big bag of 'em at Aldi!). Don't worry, gentle readers, I also brought a lovingly homemade dip - Eggplant, yoghurt and saffron, from Nigella's Feast. (I last made it 4 and a half years ago!!!) The guys seemed to like it, so I was relieved! The cheese was an organic Paris Creek Nuage blanc - it was a mild tasting, easy eating cheese. Interestingly, we picked it up at Safeway for $6 on sale (well before the use by date), but we saw it at Leo's for $12!! Then it was time for sugar overload. We made white chocolate and coffee (I wanted a "normal" flavour), mandarin (also "normal"), and Thanh really, really, wanted violet. The bizarre colour choices were Thanh's too, hehe. Purple for the mandarin flavour, green for the violet flavour. I think Duncan said they were cognatively dissonant. Baking in such a precise manner was very new for me - who knew you were supposed to weigh egg whites? 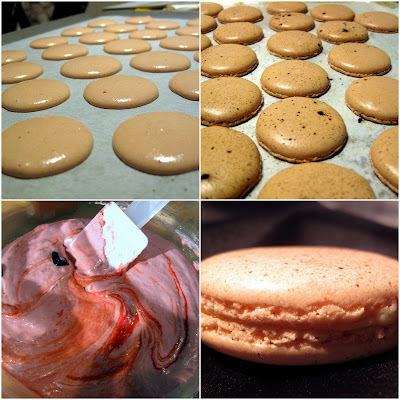 (Check out my previous ramshackle attempts at macarons here and here.) The macarons were a lot of work, but so rewarding. The white choc & coffee were my favourite flavour - and they happened to be the strongest, structurally. Mandarin was also delicious, and *gasp* I actually liked the violet! The mandarin and violet shells turned out quite wet (I think because we mixed them too vigorously? ), and over time seemed to absorb liquid from the filling, becoming more wet and breakable, whilst the fillings became firmer and jellied. Boo. We made about 30 of each flavour, which is an insane amount of macarons to have. No, we didn't eat them all at once, but we were on a massive sugar high, hehe. Thank-you to Duncan for great instruction and to everyone for a super-fun sugary afternoon! So, does this mean it is another time for a meet-up? They look wonderful. And bet they tasted better than any we can buy here in Melbourne! What did you use to flavour the violet and mandarin ones? They look so pretty. Macarons seem like such a bloggy thing to make. I'm way too nervous but might give them a go some time...love the sound of the white chocolate and coffee flavour. They look beautiful! I have the utmost respect for anyone who can make beautiful macarons. Yours look better than a few masterchef contestant attempts.. It was definitely lots of fun. I loved all three flavours and devoured every last macaron in 4 days. I consumed so much sugar in those 4 days that I occasionally got sugar rush headaches. Mexican lunch or "Por que no los dos?"